I just downloaded the latest version for P3Dv4 and installed without issue. I have read the shared cockpit instruction and followed those to include running the Configuration tool and adding the IPs. Unfortunately, once in the sim and try to pick RIO and select IP they are all listed as 127.0.0.1. Appreciate any advice on how to get this corrected. The IP addresses need to be entered before starting the sim. Open "AS F-14 Shared Cockpit Configuration.exe"
I ended up finding the problem. It appears that the new installer actually installs in two different folders, Aerosoft F-14 Extended and F-14 Extended. 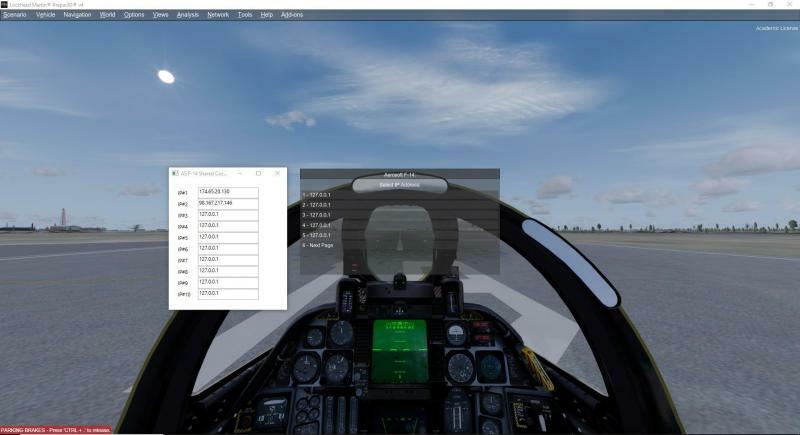 The Start Menu configuration link is to the Aerosoft F-14 Extended folder one, but the aircraft is actually looking in the F-14 Extended folder. Problem solved by running the configuration exe directly from the F-14 Extended folder. I've been trying to run this as well, and keep getting an error that says 'Unauthorized aircraft modifications detected,' followed by P3D closing to the desktop. I've been trying to run this as well, and keep getting an error that says 'Unauthorized aircraft modifications detected﻿,' followed by P3D closing to the desktop. Use a multiplayer session with TacPack cheat detection disabled. Sounds like TACPACK needs to be updated to recognize the new version... I don't have or use TACPACK, so you guys might want to let the TACPACK developer know about this otherwise you might not be able to join a server that has cheats disabled. So got on the issues worked out and was able to do a shared cockpit flight. Unfortunately, seems that the WCS might not be transferring all of the data between what was selected in the RIO pit to the Pilot. RIO locked target, but Pilot doesn't see the lock on his side. I am hoping I am just missing something, otherwise the shared cockpit in this state is useless. Thanks, I'll give this a try. I'll report back if I have better results than you did, although right now, I'd be happy just being able to fly without the functionality between the two cockpits. Thanks for the tip about cheat detection, unchecking that did it. On the integration, I didn't try any radar operations, but I did setup the payload on the client (RIO) side, and the payload automatically updated on the pilot side. Not sure if that helps or not.